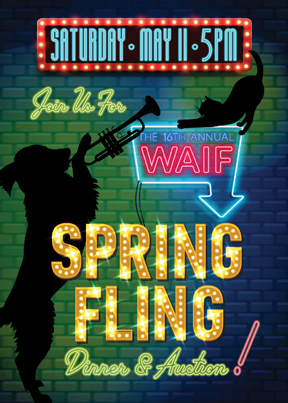 We’re very excited for our upcoming 16th annual Spring Fling Dinner and Auction that raises funds to support our efforts of finding homes for homeless pets and the community programs that help keep pets and families together. Join us on Saturday, May 11 at 5pm for this great event. We look forward to returning to Fireseed Catering located at 6051 Coles Road in Langley. Learn more about Fireseed here. Tickets are $100 per person before April 27th. Ticket prices will increase to $125 per person on April 28th. RSVPs are requested by May 1st. 21 and over only. Tickets are non-refundable. Join other compassionate animal lovers and compete to win on several silent and live auction items such as a 12-day Holland America Cruise, a four-night stay at Purcell Mountain Lodge in beautiful British Columbia with helicopter transport for two, wine and spirits, dog and cat items, gift cards and certificates for restaurants and services, Husky football tickets, art, jewelry, gift baskets, experiences, and quite a bit more! If you’re not able to attend, there are many ways to support WAIF shelter animals with this event. Consider becoming a sponsor or donating an item, service or experience that attendees can bid on and win! To receive additional information, become a sponsor, or make a donation, please contact Cinnamon Hudgins by email here or by phone at (360) 678-8906.